As I write, the overly-emotional social media tributes to David Bowie have attracted the satirists, lobbing hand grenades amongst the mourners. One which turned up on Facebook purported to be God choosing his “Rock God Supergroup” with Lemmy (from Motorhead) on bass, John Bradbury (The Specials) on drums, Bowie on vocals, and God on guitar (traipsing through a so-so version of Stairway to Heaven). There were other irreverent items, including a few mock tributes to rockers yet to leave the planet. Yes he did, 20-something albums and many other creative projects; the thin, pale Englishman kept on churning it out, along the way battling drug addiction and obviously getting past that and continuing to innovate. My esteemed former colleague Noel Mengel, who left The Courier-Mail in December after a 25-year career as one of the country’s most respected music writers, was prevailed upon to write a tribute. As only someone with his depth of experience could do, Mengel wrote about Bowie’s first visit to Brisbane in 1978 where the massive stacks of speakers at Lang Park blasted out music at a volume that could be heard at Mt Coot-tha. There is a tangible connection between our emotional lives and popular music and the unexpected death of a prolific artist like Bowie triggers memories and moments. It depends on what was top of the pops during your impressionable years. For Mengel, it was Space Oddity, which emerged in 1969 when he was 14; I was 21 and Bowie barely 22. I remember the song fondly, just as I remember watching those grainy black and white images of Neil Armstrong making his one giant leap for mankind. 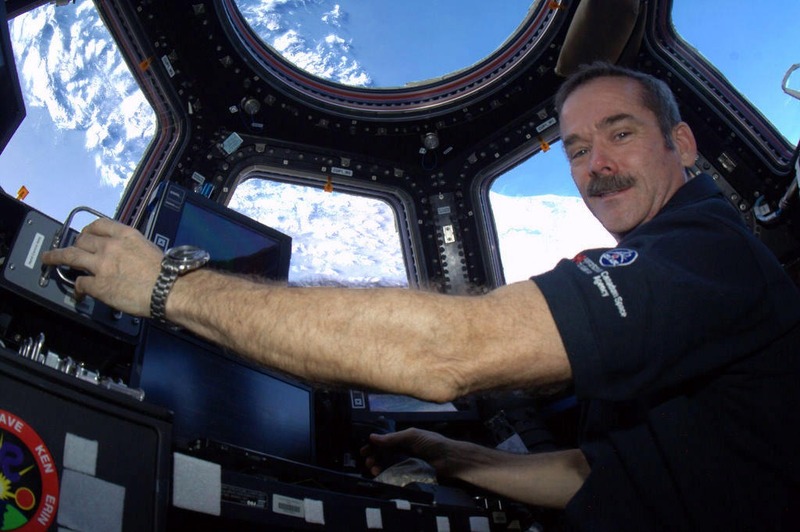 Canadian astronaut Chris Hadfield made Space Oddity even more famous than it already was with his own version, sung while free-floating in a space station. The YouTube video has attracted more than 28 million views. Bowie approved of the cover, saying it was one of the most poignant versions. If you have any doubts about Bowie’s musical acumen, pick up a guitar and try to learn that one. Good luck! Certain songs snare a piece of our hearts as we travel through life. Perhaps it was the song popular at a time when you were first courting (olde speak for ‘going out’). The emotional connections can be either joyful or sad. Whenever I hear The Carnival is Over it takes me back to the year my Mum died. Dad had locked on to that song as a grand statement about their devotion to each other. Likewise I get goose bumps every time I hear Toast and Marmalade for Tea, Fool on the Hill or Friends (an obscure Beach Boys tune), or Fontella Bass’s original hit song, Rescue Me, later re-spun by Aretha Franklin. Do not make me explain. She Who Hangs out Washing on Makeshift Line Strung Between Trees was incurably sad (as were tens of millions around the world) when John Lennon was murdered in New York. We were both sad when the Big O prematurely shuffled off. Roy Orbison was coming into a new phase of creativity at the time, with a famous super group, The Travelling Wilburys, and duets with k.d. Lang. It sounds a bit bent, but our song is probably one by Warren Zevon, he who wrote of werewolves, excitable boys, accidental martyrs and things to do in Denver when you’re dead. Warren died in 2003 of mesothelioma. Unlike Bowie, who kept his illness to himself, Wazza went out in style with a series of tell-all songs, the most forgettable being his diagnosis song, My Sh**’s F**d Up. He followed this with the near-death album, “My Ride’s Here” and closed with a collaboration album, “The Wind”, including a version of Knocking on Heaven’s Door and the unspeakably beautiful, Keep me in your Heart for a While. Ah Wazza, gone but certainly not forgotten. If you find yourself truly grief stricken by Bowie’s passing, you will probably trace it to a romance that blossomed in tango with his career trajectory. Or you may have recognised the man for the genius he was, a musical iconoclast who rarely fished in the same pond twice. As I edge closer to the age Bowie was when he died, it is becoming transparently obvious that my teenage idols are ageing with me and some are not doing so well. Others, as I said earlier, are still touring in their 70s and 80s, entertaining decades’ worth of fans. Last year Kamahl did a ‘this is my life’ show at leagues clubs and entertainment venues throughout Queensland. I went to a show in Caloundra, primarily because my musician friend Silas Palmer picked up the gig playing piano. Kamahl, OBE (over bloody eighty), can still hold a tune and is the consummate raconteur. Around that time, the Caloundra Events Centre put on a show with Petula Clark, she of “Don’t Sleep in the Subway Darling” fame. She’s still singing Downtown at 80-something. Petula outlasted many of her contemporaries, including Dusty Springfield and, more recently, Cilla Black. There, you see, I’ve probably struck a chord with someone out there who was falling in love at the same time Cilla was singing her breakthrough hit, Anyone Who Had a Heart (even though producer George Martin wanted it sung by Shirley Bassey). We lost some good ones in 2015, with Bowie just managing to see in the New Year. In no particular order, they included B.B. King, Natalie Cole. Stevie Wright, Percy Sledge, Theodore Bikel, Ronnie Gilbert, Ornette Coleman, Allen Toussaint, Lesley Gore, Rod McKuen, Demis Roussos, Val Doonican and A.J Pero, the drummer from Twisted Sister. Forgive me if I missed the dead musicians who meant more to you than any of those so named. It will come to us all, heading for the Pearly Gates (perhaps). Much has been written about David Bowie this week – some might say too much. But in case you have not read the best of them – here’s a link to Noel Mengel’s first free-lance piece for The Courier-Mail. Bowie, Chris Hadfield, Cilla Black, Dead Rock Stars, Major Tom, Noel Mengel, Stevie Wright. Bookmark. Is it because its the journos silly season, when there is supposed to be a dearth of allegedly significant news…? …because the pollies are lapping up their allocations of travel dollars on fact finding missions during the recess. Every time over the last few weeks when I switch on the radio in the morning to make sure we do not go back to asleep again, again, someone of significance has died, or some drunken idiot has punched and badly damaged someone, or a child has died in unpleasant circumstances, or the stockmarket has fallen another 2%, or the Russians have bombed another MSF clinic, or ISIS has killed dozens more innocents. Time for the Parliaments to get back to work to stop all these terrible things.